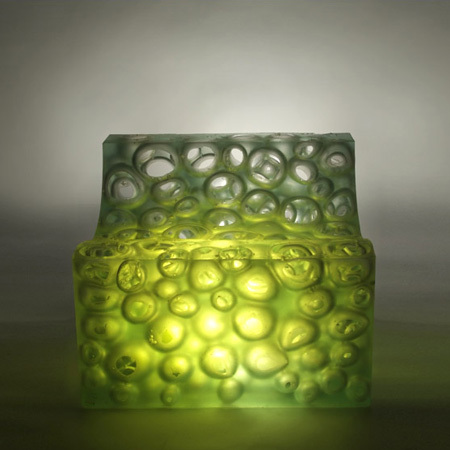 Here are a couple of images of SuperFoam Chair, a chair made of foam with giant bubbles by designer Rich Gilbert. Gilbert, a student at the Royal College of Art and Imperial College in London, cast the chair in a mold full of hollow plastic balls to create the bubbles. I'm currently studying Industrial Design Engineering at the Royal College of Art and Imperial College London and recently produced the SuperFoam chair. SuperFoam is an experiment in trying to create a super-sized foamed structure, in developing a specialized casting process I could design the properties of the foam itself so it flexed and deformed to create the chair structure. What if we had the power to manipulate nature’s structures? SuperFoam is a re-creation of naturally occurring reticulated foam structures through a casting process that facilitates designing the properties of the foam itself. By developing the casting process the properties of the foam could be controlled so the chair flexed and deformed to create a supportive structure.